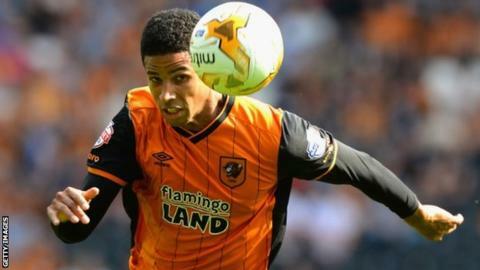 Hull City defender Curtis Davies said scratches on his face were not deliberately caused by an opponent during his side's 1-0 League Cup win over Swansea City. Defender Davies, 30, put a picture on social media of two large scratch marks on his neck just over an hour after the game. But Davies tweeted on Thursday: "I agree there was no malice in it. "I didn't even notice until HT. It was just a war wound I thought I'd share." Swansea boss Garry Monk had earlier dismissed suggestions a Swansea player maliciously caused scratch marks on the face of Davies. "Had anything untoward gone on you'd have seen a reaction on the pitch," Monk said. "It was a very clean game, there was no malice that I saw on the pitch at any point. "I think we're just guessing what that message really means. You'd have to ask him, I don't think it's directed at any Swansea player." Former Aston Villa and West Brom player Davies tweeted a picture with the caption "And they say Diego Costa is "physical" #Scarface #Claws. Chelsea striker Costa was banned for three games for violent conduct after he clashed with Arsenal's Laurent Koscielny. Monk, a former centre half himself, said the battle between defender and striker can be a physical one on the pitch. "I wouldn't say it's part of the game, but sometimes you get into battles. You can get a scratch or a cut from anything," Monk added. "It could be unintentional, it can be intentional, I've seen it throughout the years." Monk hoped the physical nature of football would not be diluted by increased scrutiny and said: "It should be physical. We should never take it away from the game. "We've cut it down in terms of reckless challenges and rightly so, but for me the physical part of it is what fans pay to see as well. "They want to see teams fighting each other for the ball, but in the right manner."